Gartner recently published its global guide to digital marketing agency selection. The study goes into detail about 21 agencies and their strengths and weaknesses. 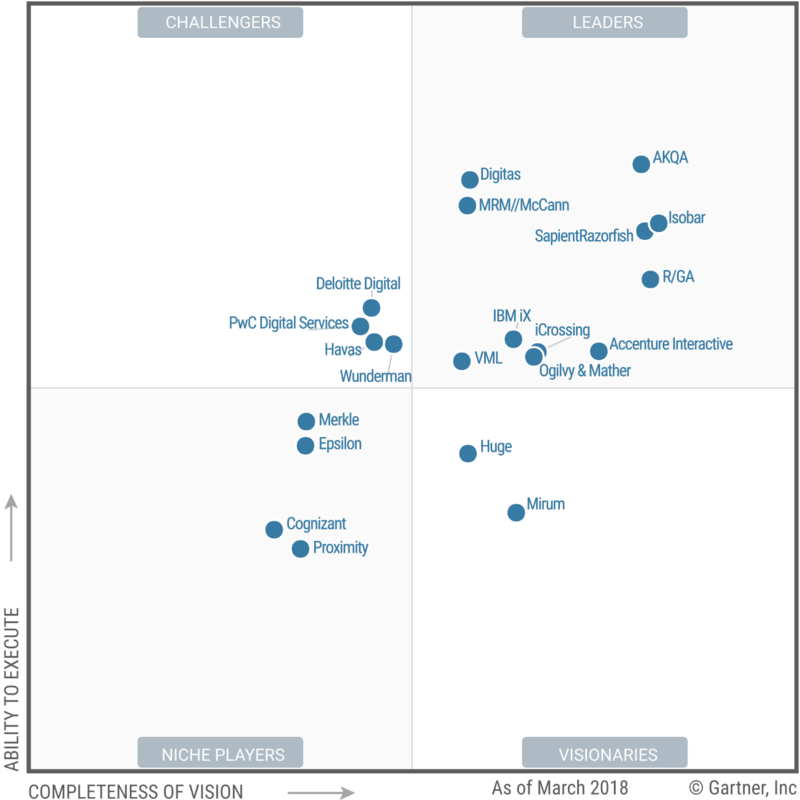 The agencies have been categorized within Gartner’s Magic Quadrant and what really stood out for us were the agencies named under the ‘Leaders’ section. Any guesses what 8 out of the 11 agencies mentioned have in common? We’ll tell you. They’ve used Unmetric! That’s right. 8 of the 11 agencies that Gartner classifies as ‘Leaders’ in the Global Digital Marketing landscape have worked with Unmetric. Digitas, MRM/McCann, Isobar, R/GA, O&M, Accenture from the ‘Leaders’ quadrant are current and active clients, as are Havas and Wunderman from the ‘Challengers’ quadrant. We’d like to congratulate all the agencies that made it to the list. We’re of course partial and have extra special hugs saved for the teams we work with. But it’s safe to say we’re just as thrilled as these agencies are and are glad to collaborate with the best minds in the industry. We <3 our clients and think they do fantastic work. The appreciation is mutual and they’ve had some wonderful things to say about us in the past. We help our clients at both brands and agencies access robust social content intelligence and analytics. This helps fine-tune strategy and get measurable results on social media. Our solution allows you to pull reports and insights at the click of a button, making your job simpler. Not only will you save time with our automated reporting feature, you’ll also have the resources you need to make data-driven strategy decisions. Thousands of real-time marketers at hundreds of leading brands and agencies across 20+ countries use Unmetric to beat their competition. We help them Analyze branded content in minutes, Discover ideas for branded content and Track it all as it happens. Here’s a quick story on how one of our agency clients used Unmetric. An IPG Agency was working on drumming up engagement before the US Open in 2016. They started off by analyzing the content and corresponding metrics to the other tennis championships happening that year namely the Australian and French Open and Wimbledon. They used this data and published content along those lines, hoping for similar engagement. Strangely, they weren’t hitting those high engagement numbers, especially in comparison with the levels they saw in 2015. Were fans suddenly just not interested in the US Open anymore? The team at the agency put on their detective hats and looked at data from 2013, 2014 and 2015 – engagement for their content seemed to be alive and thriving. The ‘Aha!’ moment came when they looked at data from 2012 – it was similar to what they were seeing in 2016. So what did both these years have in common? Both years saw the mother of all sporting events – the Olympics. They suspected fans might have been overloaded with tennis news, leading to fatigue. Looking at this data with fresh eyes, they went back to the drawing board and overhauled their publishing and content strategy. And that’s how they started winning the engagement game again. Here are few other brands and agencies that trust Unmetric. Would you like to see how we can help your clients get 7x more engagement and help your agency win more business? Sign up for a demo and we’ll show you how. ← Facebook and Instagram APIs: What Happened, What’s Affected, and What is Unmetric Doing About it?